Birmingham-based actress and comedian Janice Connolly takes on the subject of hoarding in this hour-long production. Playing the part of a woman trapped by all the 'stuff' in her home we see how beloved objects actually hold a power over her as she is unable to release herself from their grip. She is so surrounded by junk that it endangers her – the electricity in her home is faulty and the boiler breaks because engineers cannot get past the piles of objects to make a repair. With bundles of newspapers, towers of empty boxes and piles of papers around her, she's also living in a fire hazard – a risk only too obvious as she lights a cigarette. There is a strong love/hate relationship with these objects which is summed up by the fact that fellow performer and puppeteer Michael Crouch brings them alive so they become companions for the woman. Connolly, who is well-known for her comedy caricature Barbara Nice, takes the show from humour into sadness and back again, sometimes blending both to a whimsical sorrow. Here is a woman whose life was at one time full of people - there was a husband, son, grandchildren – but her addiction to her stuff has pushed them away. This element is subtly portrayed when her son calls from Australia wanting to visit with his family and she puts them off claiming she is busy but admitting to herself it is because her house is too full of things for there to be space for family. 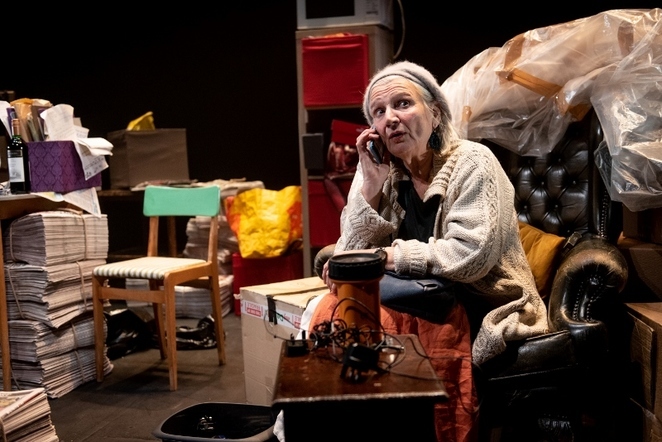 Presented by Birmingham Repertory Theatre and Women and Theatre, Stuff resulted from a series of interviews with people who identified themselves as hoarders and professionals who support them. This research ensures the production feels genuine. 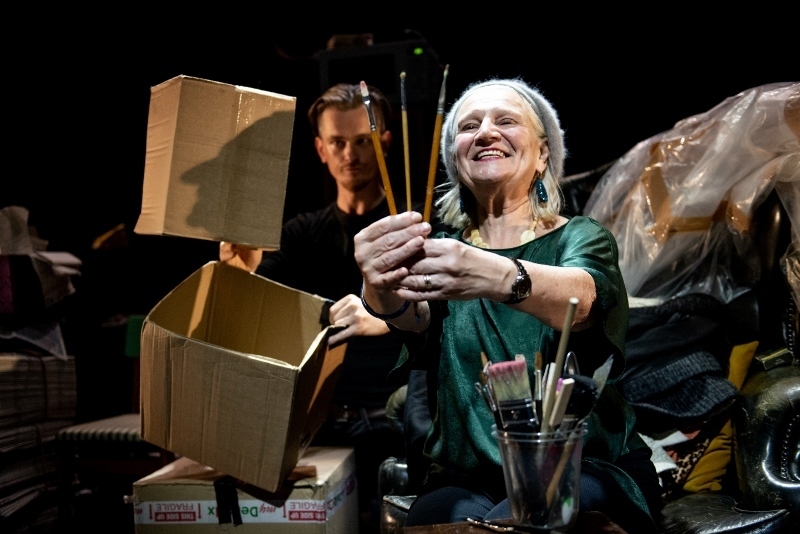 There are comments and scenes which many audience members would recognise in themselves or their friends and family – but it raises the question of when hoarding is simply keeping objects you like or which have memories attached to them and when it becomes obsessive. The difference is encapsulated in one wonderful scene where the woman decides to clear out a jar full of old paint brushes. But as she picks them out individually she has a reason for keeping each and every one of them. Some reasons have some logic 'this reminds me of holidays in Rhyl' and others somewhat less so 'I could use these three brushes to make a raft for a frog'. Women and Theatre, of which Connolly is artistic director, has long built up a reputation for provocative theatre which tackles a range of social issues through the arts and Stuff is no exception. Between the humour, we have a glimpse of a life narrowed and controlled by one woman's stuff. We are offered a chink of hope when she joins a self-help group and returns home determined to change. But when those objects have become her closest friends, throwing them away is easier said than done. Premiered at The Door at The Rep, Stuff is staged at the theatre until October 20.